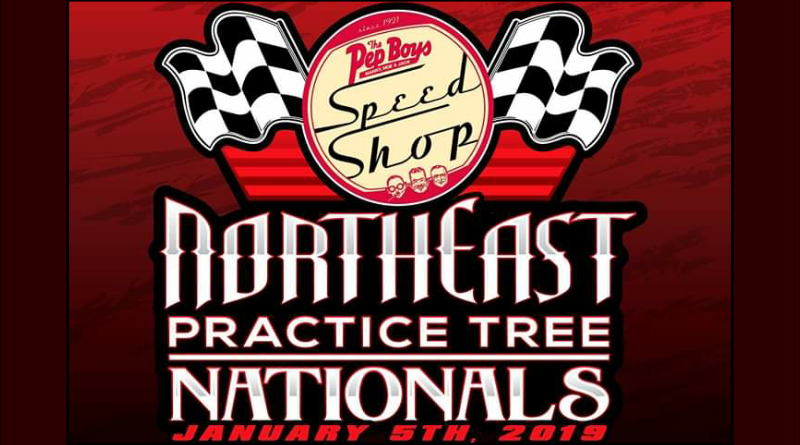 The 2019 Northeast Practice Tree Nationals comes to Marty’s Garage January 5, 2019. The 2019 event, hosted by Jeff Serra, proves to be bigger and better than ever. Lead by Pep Boys Speed Shop, the Northeast Practice Tree Nationals is supported by a number of companies this year. Additional supporters include In Motion Solutions, FTI Performance, Loose Rocker Promotions, Dialed In Podcast, and more. The C2 Converters Main Event pays $3,000 to win along with a weekend entry to the Jim Harrington Bracket Nationals. Also, the main event purse jumps to $5,000 to win with 200 entries or more. The event also includes a Bottom Bulb Eliminator sponsored by Scott’s Transmission Center. Included with the $1,000 winner’s purse is a weekend entry to the World Footbrake Challenge. The Northeast Practice Tree Nationals will also include a 64-entry shootout. The shootout is sponsored by Marty’s Garage with the winner choosing between a weekend entry at the SFG Powerball or the Loose Rocker St. Patrick’s Challenge. There’s no cover charge at this year’s Practice Tree Nationals thanks to a host of sponsors. Although, the event will have food, refreshments, and tons of door prizes. For more information on the 2019 Northeast Practice Tree Nationals, see the flyer below or contact Jeff Serra. DragChamp is your source for bracket racing news and drag race results. For more bracket racing coverage, check out this article on bracket racer Eric Tenney.